​All Dancewear can be ordered through the studio! Jazz shoes may be required for ballet/jazz combos later in the year. Plenty of notice will be given. Absolutely NO two-piece dance outfits that expose stomachs! Why is there a dress code at Norwalk Dance Center? -Young dancers are often distracted by their own dancewear. -Learning to dance and work together as a team can be more easily achieved by removing the distraction of different dancewear. Tumble students absolutely will not participate unless they are wearing a leotard and tumble shoes. Warm ups and leg warmers may be worn but must be removed at teacher request. Ballet skirts may be worn but must be removed for tumbling classes. 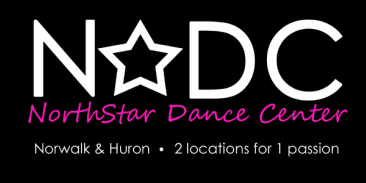 Where to buy: Leotard, Tights & Shoes can be purchased through at Northstar Dance Center. Our prices are very competitive with local retailers, if not cheaper! Stop in the office for a fitting. Orders arrive is 1-2 weeks. Hair: Ballet - Hair must be in a secure bun. NO EXCEPTIONS.